'The Shannon Suite' continues to soar. Craig Ogden (guitar) and Gerard McChrystal (saxophone) will open their upcoming Bridgewater Hall concert in Manchester later this month with Ciarán's acclaimed work, The Shannon Suite. 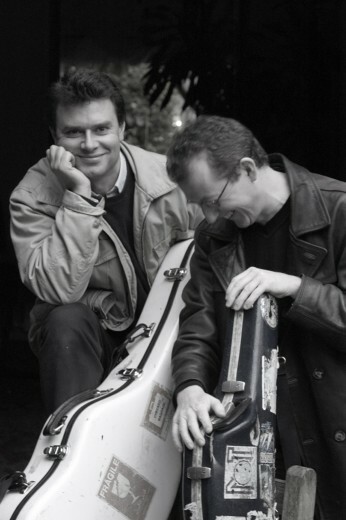 The successful collaboration between Gerard McChrystal and Craig Ogden has seen them perform the Shannon Suite over 20 times in their concerts to date. They have performed in a wide range of venues from The Wigmore Hall, London and St. David's Hall, Cardiff to the Sugar Club, Dublin. They have also recorded two discs and broadcast on BBC and RTÉ. Their concert repertoire is influenced by jazz, Irish folk and South American music, and the original works from Ireland, Germany, Australia and Brazil give the programme a truely international feel. We were blown away almost literally by Gerard who, along with Craig and the music of Ciaran Farrell, got things off to such a wonderful start. Radio presenter Paul Herriot speaking in a subsequent broadcast of the Blue of the Night Show live from The Sugar Club on Ireland's national classical music station RTÉ lyric fm.